Mustafa Khattab, the Imam of the Anatolia Islamic Centre and Muslim Chaplain at Brock University Khattab, received his Ph.D., M.A., & B.A. in Islamic Studies in English with Honours from Al-Azhar University. 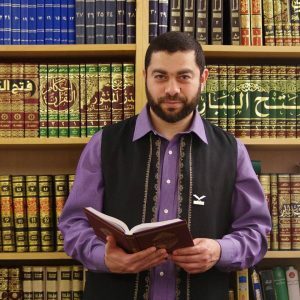 He is a member of the Canadian Council of Imams, a lecturer of Islamic Studies in English at Al-Azhar University, and a Fulbright interfaith scholar. He has served as an Imam in the U.S.A. and Canada since 2007 and is a published author. His most celebrated work is The Clear Quran: A Thematic English Translation.